Parenthood is an incredibly high calling. We cannot assume the faith of our children just because they're a part of a believing family. Yet for many parents, teaching our kids about Jesus and his gospel can be daunting. So we wanted to share resources we've found helpful and gospel-centered for helping to teach our kids about Jesus, the Bible, theology, and the gospel. In order to teach our kids about Jesus, we need to know and love him ourself! So we need to be in the Word, hearing our pastors' preaching, and in Christian community that points us to Jesus. For our family, having these resources scattered throughout the main rooms in our house makes it really easy to both spontaneously and intentionally talk about Jesus throughout the day. Don't be intimidated by the length of this list, I intentionally made it extensive because different resources will fit with different families, children, ages, etc. Just start with a few resources that will work for the life-stage of your family. 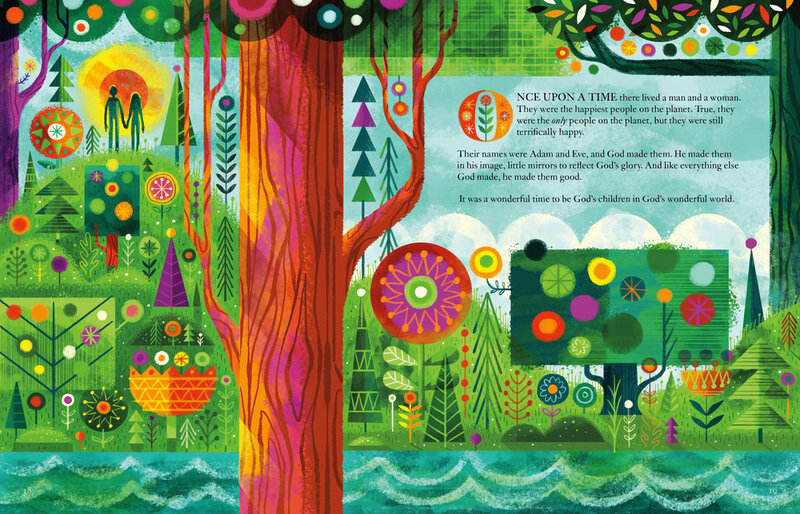 A great first step is an age-appropriate Bible for your kids. With all that being said, here are some resources we love! The Garden of Eden from The Biggest Story. The Ology - songs that teach theology. It goes along with the book with the same title. Buck Denver asks…What’s In the Bible? - these are so fun! They are by Phil Vischer who also made Veggie Tales. They have the same silliness and memorable songs as Veggie Tales but they are really gospel-centered. The series goes through the whole Bible and shows how each part of the Bible fits into the overarching storyline of scripture and also how each part points to Jesus. Bible App for Kids by Life.Church - It's free! It's a kids Bible app that reads the story to the kids with interactive, animated pictures. It's the kid version of the youversion adult Bible app. Risen Motherhood - They have a blog, a podcast, a website, and they post on social media. They have been really encouraging to me because they point to the good news of Jesus in the midst of mothering. Their website lists a even more resources on this topic and motherhood in general. Jesus is Better: Bible Stories with Gospel Joy - This podcast is working its way through the Old Testament by teaching through passages and explaining how Jesus is the better Moses, Joshua, Judge, King, etc. ABC’s of Doctrinal terms - Beautifully designed flashcards that expose kids to important doctrinal vocabulary with the word's definition and a related Bible verse. Hopefully these resources give help and support to those who're looking for it, especially for parents of elementary age children and younger. On top of actual resources, your care and parenting are priceless. Demonstrate an importance of gathering regularly with the church in big and small ways. Be present, ask your children questions, and help them see the gospel demonstrated in real life (creation, relationship, family, etc.). Pray with your kids, repent in front of them when you're wrong, remind them of their identities in Christ and need for him, and share with them what you are learning. *Sold at Hiawatha Church near the 42nd street entrance. Welcome to Easter week! The season where we Americans buy and eat a ton of candy, decorate and find Easter eggs (isn't it weird that a bunny makes all kinds of eggs?!? ), take pictures with a person in a often times creepy human sized Easter bunny costume, and where over a billion people celebrate the resurrection of Jesus. All of that seems kinda strange, right? And I'm not only talking about our American Easter traditions. It is strange that a man was dead for a few days and then became alive again. And by strange, I mean unusual. That is kind of an understatement. I've never heard of another person being killed by professional executioners and then put in a tomb for days and then coming back to life. Have you? I've never seen a resurrection. So when I hear people who're skeptical, I can be quite empathic. And it is not just Keller who argues the lynchpin of the Christian faith is the resurrection, even one of the main authors of the Bible says the same thing. Strong words from one of the authors of the Bible right?!? IF Jesus has not been raised, then it all falls apart and Christians should be pitted like no other. “Then all the disciples left him and fled.” (Matthew 26:56). Peter denies Jesus three times, once even to a slave girl. “Then he began to invoke a curse on himself and to swear, ‘I do not know the man.’ And immediately the rooster crowed.” (Matthew 26:74). After Jesus’ death, they were cowering in a locked room, terrified that the Jewish religious rulers would come after them next. But something happened that changed this bunch of terrified cowards who feared for their lives into nearly unrecognizable people. “Then Peter, filled with the Holy Spirit, said to them, ‘Rulers of the people and elders’ (the same people that they were hiding from)...Now when they saw the boldness of Peter and John, and perceived that they were uneducated men, they were astonished. And they recognized that they had been with Jesus.” - Acts 4:8, 13. Tradition also teaches that all the disciples were martyred, minus Judas the betrayer. (The authorities tried to kill the disciple John by boiling him alive but he survived and so instead they exiled him to an island for the rest of his life.) They were killed in horrific ways because they wouldn't stop telling the world that Jesus was alive! The resurrection had changed them from terrified cowards into fearless martyrs! People tend to not die for something they know is a lie, especially when they get nothing good out of it (only poverty, persecution, imprisonment, and death). Not only were the disciples' lives changed but worship completely changed for thousands of first century Jews. Now this might not sound like a big deal. "Hey, I've switched churches throughout my life or changed my views on religion and doctrine," you might say. But let's look at what would have to happen for thousands and thousands of first century Jews to change how they worshiped the LORD. First, worship was no longer on the Sabbath. The first Christians didn't observe the Sabbath. This is a BIG deal. According to the law, if you desecrate the Sabbath, you get stoned (and I don't mean the Cheech and Chong kind of stoned). If you work on the Sabbath, you get cut off from the Jewish nation. Capital Punishment AND being excommunicated from your family and people is a BIG deal! Yet the early Christians intentionally chose to stop observing the Sabbath and to worship Jesus on a new day (Sunday). Second, there was no longer a physical temple, priest, or sacrifice needed to worship God. For over a thousand years the Jewish people worshiped God in a certain way. But after Jesus' death and resurrection, something big changed. Jesus himself was the fulfillment of the temple, the priesthood, and was the ultimate and final sacrifice for forgiveness of sins. The third way that worship changed was Gentiles (any ethnicity, race, or nationality that wasn't Jewish) were now fully included. Again, for over a thousand years Gentiles were not fully included. Even if a Gentile converted to Judaism, they were still an outsider (think things like having their own outer court in the temple and not being able to fully participate in worship as the ethnic Jews were). Fourth, the church was founded around two sacraments (acts that were performed over and over again to demonstrate and remember something): baptism and the Lord's Supper/Communion. Both of these sacraments are symbolic of Jesus's death and resurrection. So the acts that the church gathered around on a consistent basis were based on their belief that Jesus DID rise from the grave. Fifth and finally, they worshiped a man. Almost no one argues that there wasn't a real human named Jesus who lived in the first century. Whether or not he was God is obviously debated but very few think that he wasn't a real man. Now whether or not you know much about Judaism, one main rule is you can only worship God. Not idols. Not statues. Not multiple gods. And especially NOT humans. But what happens just days after Jesus' death? Thousands of Jews start worshiping a MAN. Why would they risk their eternal punishment in Hell by breaking the number one rule in Judaism? Because they believed that Jesus wasn't just a man (although he was fully man) but that he was also fully God himself. They believed he was who he said he was, the Son of God who added humanity to his divinity so that he could die the death that we deserved and in our place. So the disciples risked execution, excommunication from their family, being traitors to their religion and nation, and eternity in hell. And like we said before, they all got nothing earthly out of it besides pain, suffering, and execution. Something must have happened. People don't just risk all of that and go through all of that unless something truly impossible happened. On Sunday morning, the Son of God rose from the grave. He defeated death, proving he was God incarnate, worthy of worship and allegiance. He changed the lives of a few thousand people in the Middle East, who in turn literally changed the world. What can account for all of this? The answer is the resurrection of the God man, Jesus Christ. The original hearers knew that if the resurrection "was true it meant we can’t live our lives any way we want. It also meant we don’t have to be afraid of anything, not Roman swords, not cancer, nothing. If Jesus rose from the dead, it changes everything.” -Tim Keller. Our one God is three persons. He has existed as one divine being in three persons for eternity past—mutually submitting to, honoring, and welcoming his other “selves” in all matters, remaining in deep friendship and satisfaction within his own communal being, and having the best eternal conversation with himself. But still, from his fullness, he chose to create the physical universe, including us. And even when we rebelled against this relational God, choosing a lie over his faithful, forever friendship, he did not recoil. Rather his relational perfection overflowed to us. In our finite and sinful state, we had nothing to offer him; there was no way for us to begin to understand him or relate to him at the depth of his triune-self. But, he remembered that we were dust. He approached us in love and listened to our shallow, simple, backwards thoughts and gave us his deep, complex, redeeming truth. God’s relationship with - or, within - himself is an image of the hope of the church. Jesus prays in John 17:20 that all of those who will believe in him “may all be one, just as you, Father, are in me, and I in you, that they may also be in us, so that the world may believe that you sent me.” The oneness of all believers for all time in Jesus Christ is an opportunity for belief for the world. The twist to all of this is that the source of the church’s oneness was a bloody cross when the threefold God turned away from his own self. This was an extreme act of self-sacrifice that we’ll never truly understand - when God the Father and God the Spirit abandoned God the Son to death on a cross. In this act, Jesus became completely removed from his full self, to suffer relational abandonment through death. But, nothing could keep God from the one he loves. God’s Spirit raised Jesus from the dead and made him victor over it, seating him at his right hand, and giving him the name that is above all other names. And again, through this death, resurrection, and exaltation he made a way for fallen people like us to be brought back into friendship with him forever. The good news of the Trinity is that God did not need a relationship with us (he already had that within himself! ), but he chose it anyway, and gave his life to get it back when we tore away from him. So, our salvation is not: “God needs us for something.” But instead, “God wants to share himself with us.” What a relief! What good news!